The National Museum of Modern and Contemporary Art of Korea will step up efforts to lead the contemporary art scene in Asia, it said. 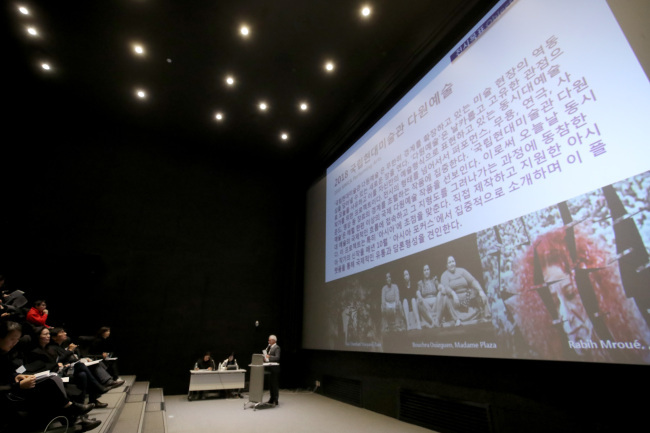 During a press conference held in Seoul on Wednesday, the MMCA Director Bartomeu Mari announced the museum’s 2018 exhibitions of acclaimed artists here and abroad, as well as projects underscored by its long-term vision of becoming a leading voice of the contemporary art scene in Asia. For this year, the MMCA has prepared exhibitions of several internationally acclaimed Korean artists, including painter Rhee Seund-ja, photographer Lee Jung-jin, visual artist Bahc Yi-so, painter Yoon Hyong-keun and architect Kim Chung-up. To commemorate the 100th anniversary of the birth of the late Rhee, the museum will highlight 50 works of the painter in an exhibition titled “The Road to the Antipode” at the MMCA branch in Gwacheon from March to July, providing an opportunity to revisit and rediscover the prominent female artist. The museum will also hold an exhibition introducing some 200 works of Bahc Yi-so, shedding light on the late Bahc’s works, as well as the artist himself. The exhibition will begin in July in Gwacheon. The MMCA this year will organize exhibitions of foreign artists too, including American-French artist Marcel Duchamp, one of the behemoths of the 20th century art. About 50 works by German video artist Harun Farocki will be shown at the MMCA in Seoul from October. In May, some 30 works of Lebanese artist Akram Zaatari will make their way to the MMCA in Seoul. During the second half of the year, the MMCA will exhibit three to four works by Jenny Holzer at its Seoul and Gwacheon branches. Meanwhile, as part of its focus on the arts scene in Asia, the MMCA this year plans to continue projects dedicated to supporting Asian artists in presenting their unique performing arts, as well as multidisciplinary and joint-commissioned works. With its performing arts project beginning in March, the MMCA plans to present genre-crossing performances monthly throughout the year, ranging from dance and theatrical pieces to sounds and visuals. In a project titled “How little you know about me,” the MMCA will also introduce promising Asian artists’ works in Korea. In addition to the planned exhibitions, the MMCA will continue joint research projects and exhibitions with the National Museum of Modern Art in Tokyo, National Gallery Singapore and Japan Foundation.